The thing that I enjoy the most about weekends in the summer is sitting outside on the patio at dusk, sipping a beverage, while the kids play in the warm night air. Drinking out of Mason jars is the new popular thing. There is something to be said about drinking out of a Mason jar. It that makes me feel cool with a little twist of country at the same time! This Mason drinking jar by Smartplanet is nice for several reasons. The first thing I like about it is that it looks like a Mason jar, but it’s plastic. I love glass, but when you have two little kids constantly running around and grabbing your drink – plastic is more practical and not breakable! This drinking jar is eco-friendly and is made out of 100% recyclable product, and is also 100% BPA free. The second thing I like about this drinking jar is the fact it has a handle! Drinking out of a Mason jar is fun, but on hot nights when your drink is sweating, it’s a lot easier to hold on to with a handle. This jar has an aluminum lid with a spill resistant straw hole. I can verify it really is spill resistant, as my kids have knocked this over several times on me. It comes in four great colors: Blue, Green, Purple and Clear. The jar holds 16 Fl. Oz. which is the right size for whatever you choose to drink. My kids also love drinking out of this! Be sure to check out Smartplanet on social media! If you follow, you can ask for a 20% off promo code. Just tell them you heard about Smartplanet from The Mommy Bunch and you’ll get a code to use. 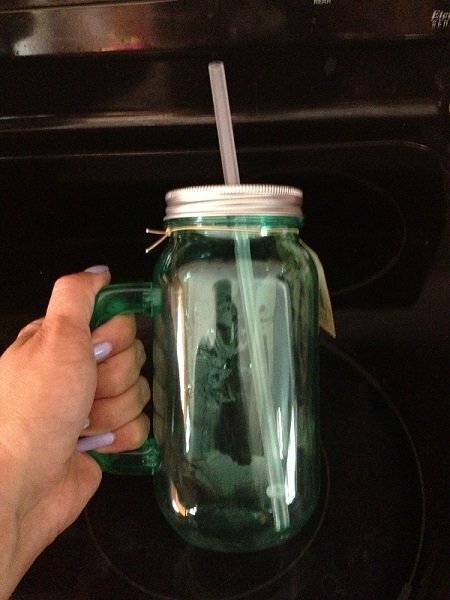 Home / News / Mason Drinking Jar – Perfect for Summer Sipping!